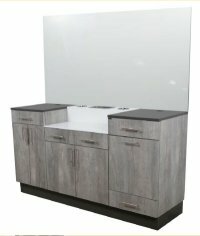 Barber chairs are built to be tougher and to handle more weight than either beauty salon styling chairs or unisex styling chairs. The width between the arms of a barber chair should be 23 inches to 24 inches to allow a big man to sit comfortably in the barber chair. The hydraulic base under a barber chair is also bigger than a beauty salon chair base. 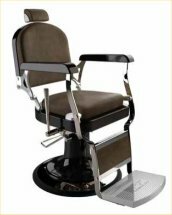 The diameter of the base plate of a barber chair is 26 inches, three inches greater than the diameter of a beauty salon styling chair. The lifting capacity of the hydraulic pump of a barber chair is also greater than the pump of a beauty salon styling chair. The extra heavy duty barber chair pump is rated to hold a 400 pound person. A popular feature found on some models of barber chairs is a synchronized legrest. When the barber chair seat back is reclined, the legrest of the chair rises up to support the customer’s legs and feet in a more comfortable position. 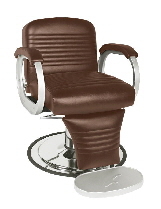 Collins full-size barber chairs have a gas-assisted hydraulic cylinder inside the chair back cushion of the barber chair. The purpose of this cylinder to help you move your client up and down with ease as they are reclined or sit upright in your barber chair. Unisex chairs such as the Hackney #7900 are built with seats larger than a beauty salon styling chair but not as large as a barber chair. 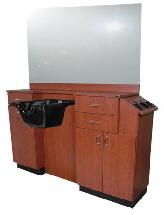 The extra heavy duty base, however, is used with the unisex chairs. manually operated hydraulic base. The barber chair rises electronically with a motor base, it goes down by gravity.